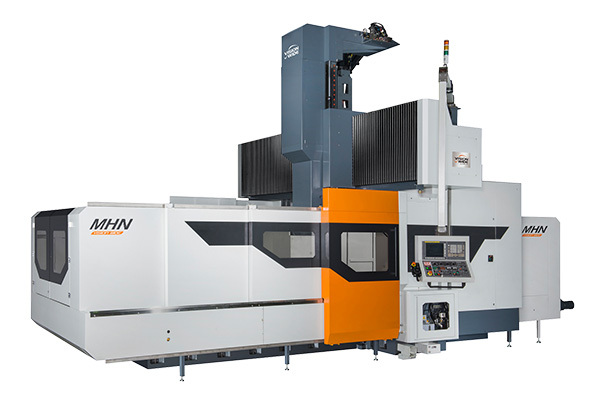 With Vision Wide tradition in making high rigidity machine structure, MHN series not only plays a high precision indicator in 5-face machining centers but also provides a full range of high efficiency cutting performance through its rigidity structure design and excellent geometric accuracy. More than 1,1m height of rigidity stepped beam structure efficiency enhances guide way span and provides Y-axis straightness and rigidity needed for heavy cutting. Y-axis with 65mm ultra-load guide way not only enhances more than 40% rigidity on higher cutting load but also extends longer lifetime. Full stroke supported design, thick and extra-wide design size of bed structure with highly rigid structure, increases table load capacity and workpiece movement dynamic level, reaches the cutting stability and enhances anti-vibration. One-piece casting column structure with thick column section size, effectively link the rigidity of beam and base, enhancing YZ-axis machining rigidity. Minimum distance between spindle center and Z-axis roller way not only shortens cutting lever arm but also significantly improves cutting rigidity.